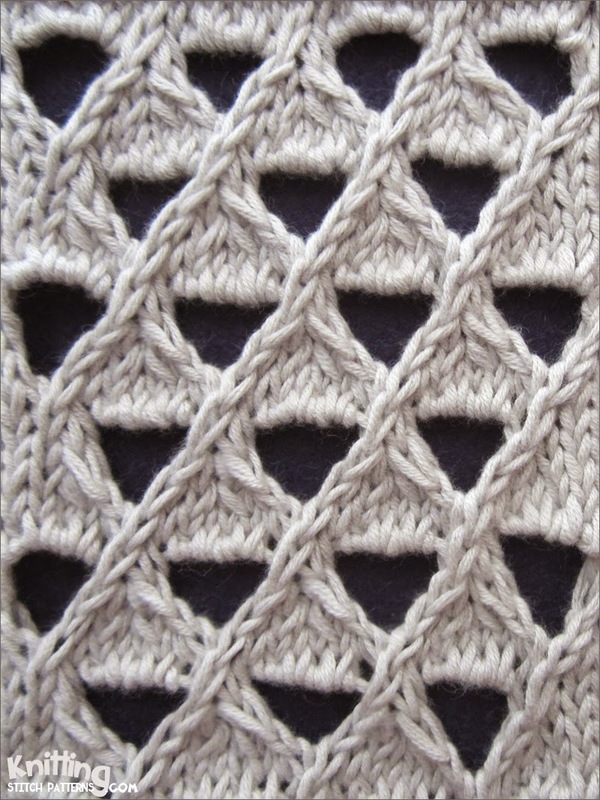 The Grand Eyelet Lattice stitch is an 8 row repeat and is knitted in a multiple of 8 stitches. Row 2 (Right side): * (K2 tog) twice, (yo) twice, (ssk) twice; repeat from * to end. Row 3: * Ssp, (p1, k1) 3 times into the double yo, p2tog; repeat from * to end. Row 4: K1, * k6, k2tog but do not slip from needle; insert right-hand needle between the stitches just knitted together and knit the 1st stitch again, then slip both stitches from the needle together; repeat from * to 7 sts, k7. Row 7: P4, * ssp, (p1, k1) 3 times into the double yo, p2tog; repeat from * to last 4 sts, p4. Row 8: K3, * k2tog but do not slip from needle; insert right-hand needle between the stitches just knitted together and knit the 1st stitch again, then slip both stitches from the needle together, k6; repeat from * to last 5 sts, k2tog but do not slip from needle; insert right-hand needle between the stitches just knitted together and knit the 1st stitch again, then slip both stitches from the needle together, k3. Slip slip purl through back loop: Ssp | Slip slip knit: Ssk.